Summer beet (and potato and cucumber) harvest! We harvested some of our beets this weekend. I’m the worst photographer ever so I’m pretty proud of this shot. It doesn’t quite come across but the beet on the left is about the size of a softball. 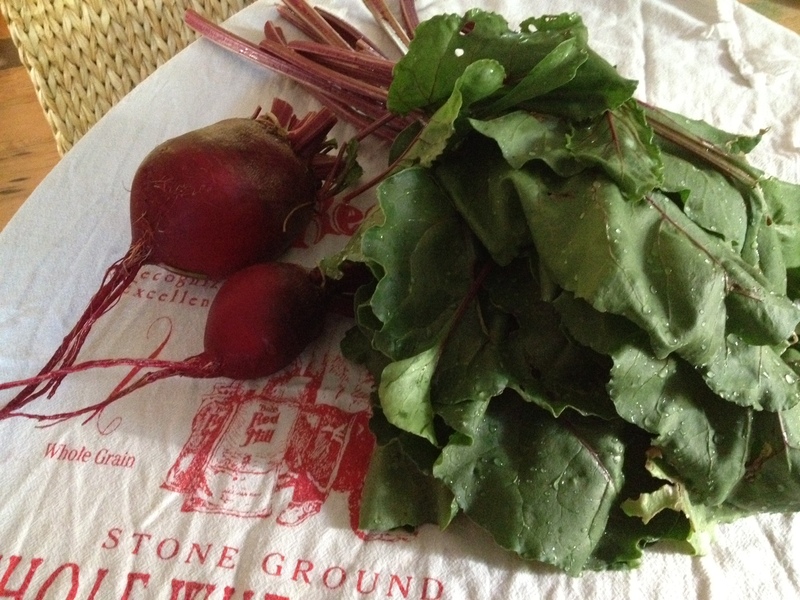 Huge and wonderful and the beauty of growing beets is that you get two vegetable out of it. The first night I used the tops. I cut up the red stems into a fine dice and threw it in some olive oil with some diced red onion. I sauteed them until they were slightly brown then added in some freshly grated ginger, salt, and pepper and after sautéing tat for another minute or two threw in some white wine. I then sliced some red potatoes (also from our garden) very thinly and added that into the mixture. I simmered this all on low with the cover on until the beet stems were soft and the potatoes were cooked (adding water if needed along the way). I then threw in the chopped up greens and put the cover back on and cooked this until the greens had wilted. I then took the lid off, stirred everything so that the greens were evenly mixed in with the stems, potatoes, and onion and placed pieces of whitefish on top of them. I then covered the pan again and let it simmer once more until the fish was cooked through. A one pan meal that was very tasty. The next night I roasted the beets themselves in a 400 degree over for an hour and fifteen minutes. I like my beets straight up with nothing to distract from the sweetness. I also harvested some cucumbers from our garden (it’s produce-palooza over here) and decided to make a salad. I always make my owen dressing and this one was a combination of sesame oil, olive oil, tamari, rice wine vinegar, ground ginger, salt, pepper and a bit of honey. I used a bit of this dressing as seasoning for some salmon fillets. I brushed the fillets with some of the dressing, wrapped them in foil, and threw them on the grill outside for about six minutes. So delicious! It’s amazing how creative you can get when you are inspired by the veggies you grew in your own garden. I wish I’d taken pictures of the actual meals, but I was still riding the high of the fabulous beets picture that it didn’t even occur to me. Stay tuned because my tomatoes are on the cusp, my lettuce and carrots and rainbow chard made it through the horrendous dry heatwave, my red okra is starting to produce and the cucumbers have gone crazy.